The advent of Steam has given rise to two major developments in PC gaming: a huge volume of indie games being released to the masses, and the popularity of game bundles that offer a variety of games for a fraction of the price you’d pay when buying them separately. “Mommy’s Best Action Pack” is a combination of these two developments. Weapon of Choice: A side-scrolling shooter inspired by 8-bit and 16-bit games like Contra, Turrican and Midnight Resistance. The art style is distinctly retro but with plenty of modern day effects, and the game includes several touches like alternate characters and level paths as well. Shoot 1UP is an homage to the traditional vertical scrolling space shooter – though much more like the present day bullet hell shooters than the old 16 bit shooters were. 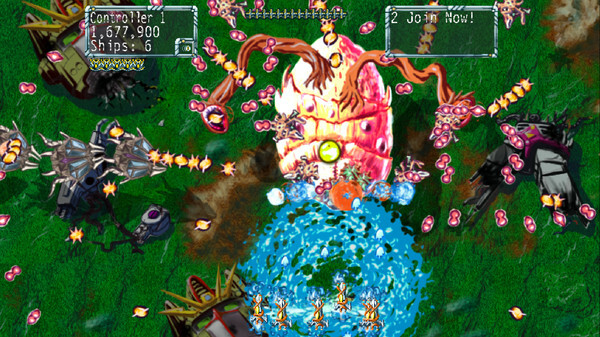 The twist in this particular version of a bullet hell shooter is that you control a multitude of ships at once, benefitting from the increased level of firepower that that brings with it. It’s essentially how a traditional shooter plays after you’ve powered up completely. Explosionade: Not surprisingly, another shooter – but very different from the first two games. 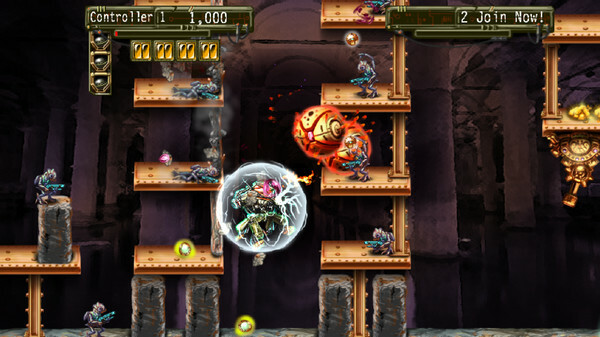 Explosionade’s levels are usually small – sometimes no bigger than a single screen – making the action frantic and fast. It’s a side-scroller like Weapon of Choice, but with destructive environments and a lot more emphasis on platforming. Game Type: This is the most unique game of the bunch – a side scrolling like R-Type, but with a crazy and colorful art style and a gameplay mechanic where you re-do a level at a faster and faster pace until it becomes too much to handle. At roughly two dollars per game, is this collection worth it? For fans of traditional retro-inspired shooters, this is definitely a pack to check out. All of the games are easy to pick up and play, though they don’t all hold the same level of lasting appeal. Game Type was our least favorite game and felt almost experimental in terms of gameplay design, and Weapon of Choice was our clear favorite. Perhaps it’s because it’s the game that is best able to stay true to the original greats that inspired it – or perhaps that’s our nostalgia speaking.